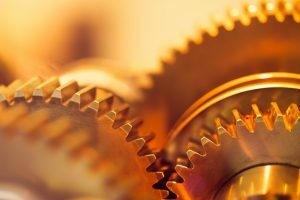 The powder metal process provides engineered components in just about every industry today, especially producing high quality gears of all types. 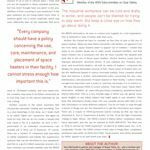 The following article outlines just one application segment: precision pump and metering gears from powder metal. Powder Metal (PM) gears are used in pumps across a wide spectrum of industries. These include lube pumps for power transmissions in automobiles and heavy trucks, off-road and agricultural vehicles, the food industry, hydraulic lifts, metering/dosing fluids, and moving chemicals. (see Figure 1). 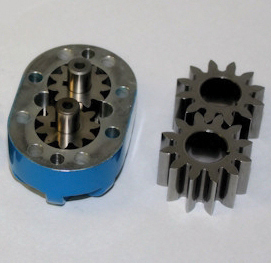 PM gears are used in these industries to lower cost without sacrificing quality in the pump application and because of the many design options available in the development of the tooth forms and root radius. There are many raw materials available for producing PM pump gears. 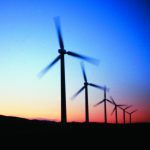 They range from low/medium carbon steel in lower pressure pumps, to the higher-carbon alloyed steel materials that some pumps require for higher pressures, optimum gear strength, and excellent wear characteristics in applications requiring long life cycles. It is very important that the PM manufacturer know all the functions of the pump, especially the operational requirements and any special fluids to be used in the pump or metering operation. The PM producer can specify the exact gear material by the critical properties needed. 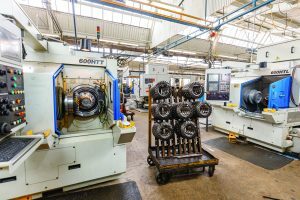 Then, with the appropriate process defined, the gear set will have what is necessary to ensure the success of a PM conversion from other gear manufacturing processes. 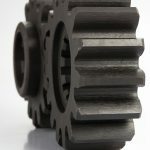 Strength of PM materials has advanced today for PM gears applications. 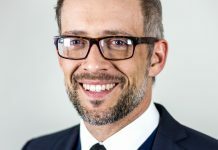 Using lower-cost, conventional processing methods, it is now possible to produce gears with tensile strength over 200,000 PSI with yield strengths near 190,000 PSI. 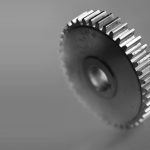 For a long gear life, one can also expect micro hardness of PM gears after heat treat to be R/C 58-60 when produced from one of the many alloy steels available to the manufacturers today. Again, it is very important to advise the PM vendor of all your pump’s requirements. 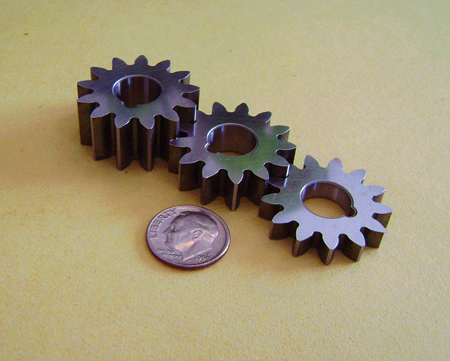 In the PM process the gear tooth is not cut from a blank, but rather pressed in a forming die (see Figure 2). 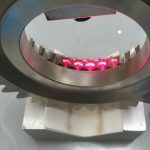 The raw material is transferred over and dropped into the die, which contains the shape of the gear form. Punches enter the die from the top and bottom, compacting the shape and size of the gear. 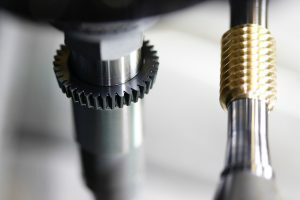 The PM process is capable of producing a gear with up to an AGMA Class 8 quality, without the cost of cutting or roll forming each tooth separately, or without any further secondary operations needed to define the gear form. 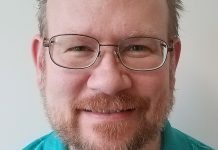 Unlike some processes, most of the PM manufacturers charge you for the initial set of tools only, then maintain those tools for the life of the part design, or until a possible change is made to the gear that requires new or partial tooling. Most gear pumps use a family of gears—a series of gears with different lengths to control the flow of the pump. The design features are all the same on this family of gears, with the exception of the gear thickness varying (see Figure 3). 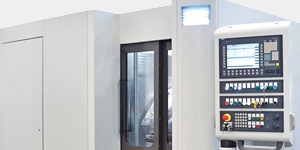 In most cases, one set of powder metal tooling can produce all the series lengths, keeping your upfront tool cost minimal with an attractive ROI. 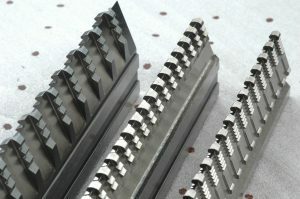 Annual volumes play a large part in the tooling payback equation, but because of the expected cost savings over gears produced by other processes, even annual volumes as low as 1,000–2,500 pieces a year have been tooled, replacing a current cut steel gear, cut forging, one being preformed with teeth shaved, or a machined casting. Not all PM pump gear producers quote volumes this low, but a thorough search will find those that will. 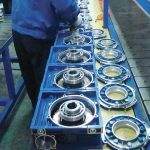 Of course, the PM process is capable of producing very high volume production also, especially in the OEM and aftermarket automotive industry. 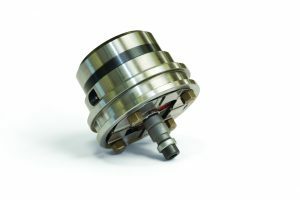 Another cost-saving advantage of a PM pump gear is that the gears’ ID shape—such as a spline, keyway, d-shape, or a hex shape—does not have to be broached or milled at a very high cost. 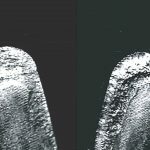 The same method used by PM tools to form the teeth also applies to the ID shape. Many different ID designs are possible, and can be molded in on a core rod at standard dimensional PM tolerances. 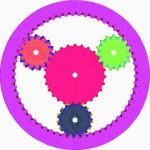 Should you need a closely-toleranced ID, as many gears do, the shape of the ID (e.g. a round bore with a keyway) is molded in, but also may need a final turning or a grinding operation to hold the precision bore tolerance. 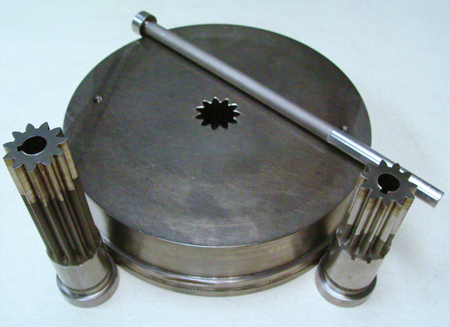 Some of the typical tolerances that can be held using the PM process, including some secondary finishing operations, are shown in Figure 4. 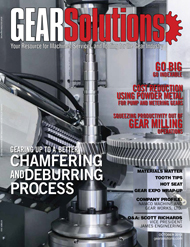 Gear designers and product engineers find they have a much greater opportunity for optimum and consistent flow rate, increased tooth strength, and pump operational noise reduction using PM pump and metering gears instead of gears that have been hobbed. There is virtually no limit in the involute profile design/shape where the objective is noise reduction in the meshing of the two shaft-mounted gears. 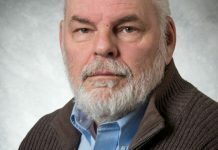 For added tooth strength in higher-pressure pumps, a full fillet radius is possible at the root diameter, and also includes more options for the tooth form starting up from the root radius of the gear teeth. The tooth tip can be a full radius design, a flat sharp tooth tip design, or somewhere in between. 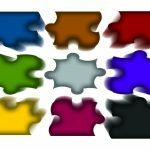 Whatever the design application requires is likely available with PM gears. Edge quality of the gear teeth is also important, whether you use the gear set to seat in your housing or want a more defined corner edge size that does not dig into the pump housing. 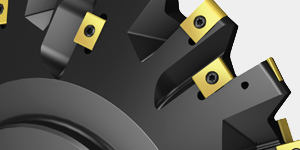 A crisp edge or minor break prevents the fluid from escaping under the gears, increasing the pumps efficiency. 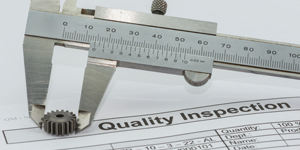 For these reasons, the edge quality is very well controlled in PM pump gears. 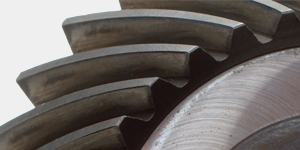 Discuss this area with your PM vendor to ensure you have the proper process applied to the gear tooth edges/corners. 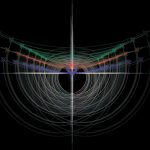 There are multiple ways to approach the edge definition, so it is important the PM vendor knows what is expected of the pump. Powder metal pump gears wear very well, and with the proper material specified the user can expect that the gears will last through their full life cycle. Properties such as pump pressure, RPM, types of fluids used, any special conditions such as excessive hot or cold temperatures, or high-pressure starts should be discussed with a PM vendor. Again, how many cycles the PM gears can withstand varies based upon the above parameters, the gears raw material chosen, the heat treat process applied, and any post heat treat options needed. Dependent upon the process and the properties needed, PM Manufacturers have many options in the heat treat process to choose from. 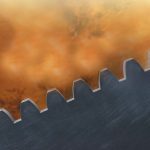 Not every company offers all of these, but some of the heat treat options include: through-hardening, case hardening, induction hardening, sinter hardening, and post cryogenic treatment of the gears. 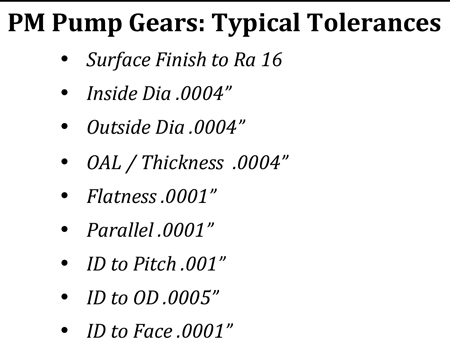 Make sure the vendor knows the pump application’s exact function so they can develop a gear that not only performs to your requirements, but also has been given every cost-effective consideration available when using PM Gears. From the information above, you can now see that by using powder metal pump and metering gears, produced to the customer’s exact precision tolerances while using one of the PM industry’s wide varieties of materials, can ensure your pumps meet the most strenuous performance requirements. 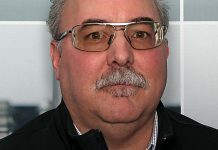 After working with a potential PM vendor to establish the properties your pump application needs, a quality set of gears will be produced that perform in your pump issue-free. At the same time, high-quality PM pump gears offer excellent cost savings when compared to other processes. High quality powder metal pump gears are being made by the millions. 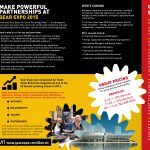 In a globally competitive market today, PM pump gears offer the cost savings needed to stay ahead of your competitor and the quality to ensure current gear tolerances are met. They provide many material options to ensure gear performance, and a high-quality process in place to ensure the life expectancy of the pump. Powder metal should be shaping your current and future gears.